When your favorite cheese shop has a sign like this one outside, it's a pretty safe assumption that you're in good hands. This month's Washingtonian magazine has a great article about cheese, and La Cheeserie is right to be proud of the coverage they receive. But what does this mean to the average customer? If my recent experience at Calvert-Woodley Liquor is any indication, it means quality, knowledgeable service and an extensive selection with an emphasis on recognizable varieties primarily from Europe. Although you're not going to find some of the smaller, artisanal producers that are prominently featured at boutique shops, you will find great deals on well-known cheeses like Roquefort, Parrano, and Manchego. The deals here are further enhanced by sales - something that definitely sets La Cheeserie apart from the other cheesemongers I've visited in the DC Metro area. 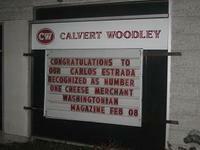 Published weekly in newspaper Food sections, Calvert-Woodley runs advertisements that mark down various cheeses from their already competitive prices. 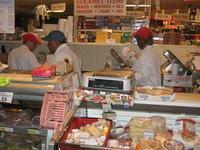 On my visit, I saved $3 per pound on a favorite blue cheese. The deals change from week to week, but they always encompass a wide range of styles and they include the familiar as well as the unknown. As if that weren't enough, La Cheeserie offers one more reason for cheese-lovers to celebrate: Cheese Treasures! What is a Cheese Treasure, you ask? It's a stroke of genius. More than twenty years ago, the cheesemongers at Calvert-Woodley decided that they were sick of getting stuck with small, leftover pieces of cheese when larger wheels were sold piecemeal. 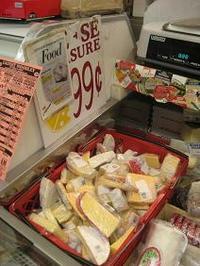 Rather than throwing them out or combining them into large quantities of fromage fort, they simply re-wrapped the bits and pieces and started selling them for 99 cents apiece, regardless of the cheese's original price point. Needless to say, customers responded. Today, the tradition lives on, and the counterpersons at La Cheeserie are happy to tell you all about the day's Cheese Treasures, whether they be smoked gouda, Comte, or brie superieure. This Dollar Menu approach to cheese is a great way to try something new without committing to a full purchase. Although the cheeses are sold unlabeled, the sales staff can help you identify your purchases - even if you come back and ask about them at a future date. Calvert-Woodley's La Cheeserie is definitely unique in the Washington area in terms of selection, specials and setup; it's a great place to find deals on big-name cheeses from around the world. If you're looking for locally-produced, small batch goat cheese, you may want to look elsewhere, but if you're eager to try something new you can't beat a 99-cent Cheese Treasure and some Firehook Bakery crackers!